Jamabi Yumeko’s charisma and obsession with her craft has netted her loyal friends in Suzui Ryouta, Sumeragi Itsuki, and Saotome Mary. Suzui isn’t even going to oppose her decision to challenge the President; he’ll stay by her side. So will the girls, but when they present a variety of ways to cheat in the upcoming gamble, Yumeko is grateful, but declines any shenanigans, which will only ruin the fun. All she wants is to gamble with Momobami, and all Momobami wants is to gamble with her. They both decide to leave things up to fate—literally: the scoring in their game will be determined by the values on various cards in a Tarot deck. Momobami will pick for the past, Yumeko for the present, and Ryouta for the future. 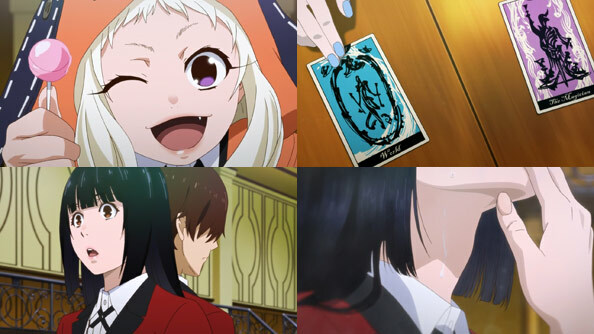 But just one card, The Fool, could determine Momobami and Yumeko’s fates. Whomever loses must leave the academy forever. This is pretty simple stuff, and it’s basically a means of determining if either gambler has the “stars aligned”, as it were, in their favor; considering the success both have found in past gambles, they’re both pretty “lucky” gamblers, but it’s their drive to make greater and riskier bets that enables them to access that luck, where more timid players may shrink. I will say that the overseer of the game, the lolipop-sucking, fang-bearing Yomozuki Runa, is a frequent and grating distraction; it was never explained why she’s so tiny or why she wears an animal costume or how and why she’s so good at gambling that she’s on the student council, so it’s hard to care about her that much. But at least she’s not a direct participant in the game, just the ref. When Yumeko draws a +1 card and Kirari draws a -21, putting Yumeko in a 20-point hole, one person who is a participant and ultimately does not shrink before his duty is Ryouta. While initially clearly scared of all the responsibility foisted upon him to the point of being overwhelmed, Yumeko calms him by assuring him that the responsibility is hers and hers alone; she chose this game, and will accept whatever outcome. But Ryouta says she’s wrong: he is responsible for the card he chooses, and how it will affect both Yumeko’s future and his own. He doesn’t want her to leave the academy; he wants to remain by her side, either supporting her or playing against her. 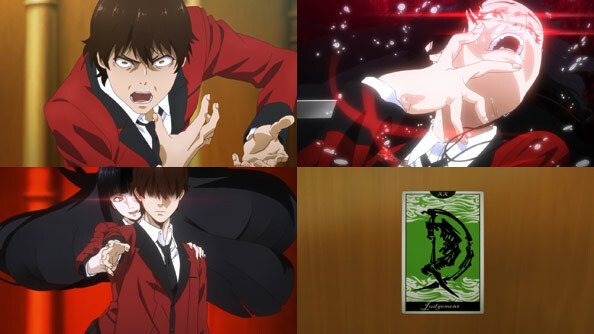 His speech voicing his commitment causes Yumeko to have one of her patented gambling-gasms, the last of the season, and he avoids the card almost too obviously marked as potentially The Fool (the card that will cause Yumeko to automatically win) and instead draws Judgment, which nets Yumeko 20 points for a total of +21 to Kirari’s -21. It’s a draw – no one has to leave the academy. 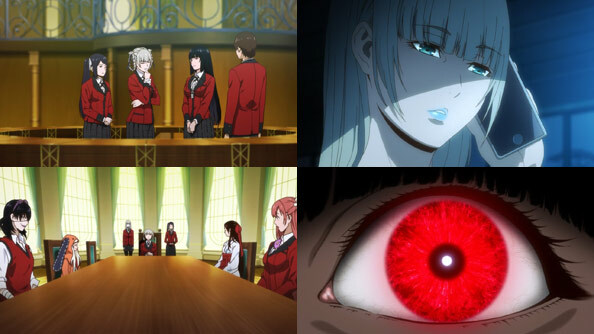 With this result, essentially everyone wins: Momobami stays on as president, but seems open to dissolving the council in light of someone like Yumeko blowing up her “aquarium” for the better; Ryouta, Mary, and Itsuki don’t lose their crazy new friend; and Yumeko remains at the academy, and is able to continue doing what she loves best. Despite the stakes, Kirari and Yumeko’s final gamble can’t really touch some of the previous gambles that had more time to marinate. As for the reveal that Runa is in contact with “Momobami Ririka”, the mask-wearing council member Kirari disguised herself as last week, elicited little more than a shrug from me. But the stage is set for a possible second season down the road, perhaps with a fresh set of new, distorted faces, new alliances, and new gambles. 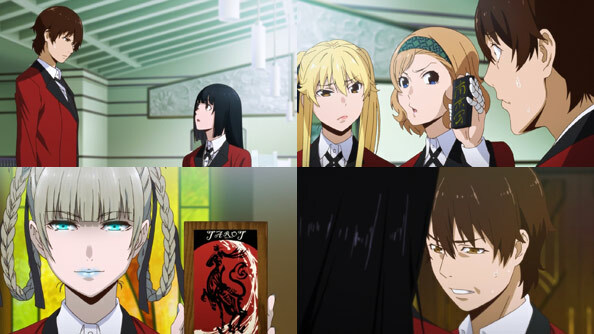 If this episiode didn’t mark the end of Kakegurui, I’ll probably take a peek at its continuation. This episode sound pretty lit and since the show is over I can binge watch the second half of the show.